Here’s what’s up in the world of TV for Wednesday, June 10. All times are Eastern. 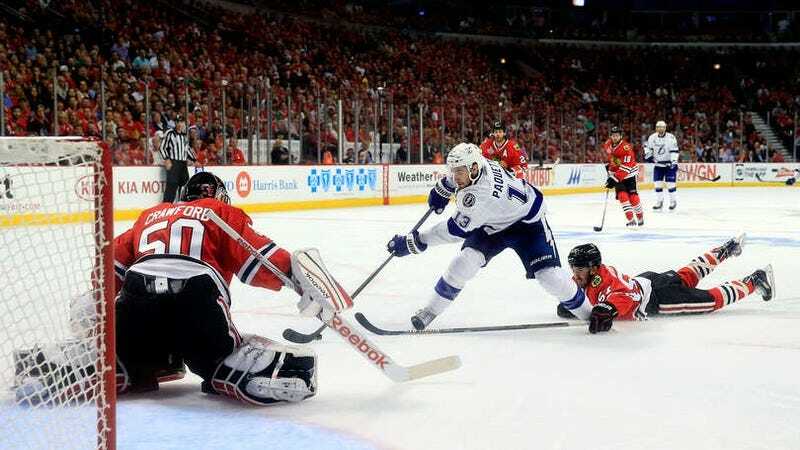 NHL Finals: Lightning at Blackhawks (NBCSN, 8 p.m.): The Tampa Bay Lightning are up two games to one over the Chicago Blackhawks. It’s a best of seven series. Hockey is played on ice. On a related note, Wednesdays are super-slow for TV this time of year. Play puck! WWE NXT (WWE Network, 8 p.m.): Kyle Fowle steps up to give the blow-by-choreographed-blow rundown of the WWE’s best up-and-comers. Remember when 1999 was the future? Director Kathryn Bigelow’s Strange Days may have posited some things that didn’t come to pass, but Danny Bowes’ Watch This suggests that the film’s technological dystopia might have gotten more right than you’d think. Our look back at what was up in 1995 continues with an Inventory of all the pop culture responses to that whole O.J. Simpson trial. Then 1995 Week continues with Anthony John Agnello’s less-than-fond look back at Nintendo’s folly, the Virtual Boy. Lost (Classic) (1 p.m.): Myles McNutt and Noel Murray reach the end of their look back at season three, finally closing the gap on the initial AV Club Lost coverage, and singing the praises of the game-changing “Through The Looking Glass.” (And saying goodbye to [REDACTED]). Uncle Grandpa (Cartoon Network, 6 p.m.): The evil machinations of a mayor named Pizza Steve. Mayor McCheese would never stand for such nonsense. MLB Baseball: Red Sox at Orioles (ESPN, 7 p.m.): These teams are not very good. Enjoy! The Briefcase (CBS, 8 p.m.): CBS’ exercise in pitting poor people against each other adds a new level of distasteful dramatic irony, as a fundamentalist Christian couple doesn’t know that they’re debating whether to give some of their briefcase full of cash to a lesbian couple. Way to ratchet up the drama, CBS. CMT Music Awards 2015 (CMT, 8 p.m.): In addition to Darius Rucker, Reba McEntire, Lady Antebelleum, and the usual suspects, this fan-voted country music awards show also features appearances by those down home country Arnolds, Tom Arnold and Arnold Schwarzenegger. MasterChef (Fox, 8 p.m.): The contestants prepare crab dishes, which, from the commercials, entails a group of professional cooks freaking out and yelping “Eek! Eek! Eek!” at the prospect of touching a live crab. Serenity (Cinemax, 8 p.m.): Let us all revisit Joss Whedon’s achievement in getting the band back together for this rousing film continuation of Firefly. And then let’s sit staring off into the ‘verse, ruefully imagining what might have been if anyone had actually gone to see the thing. Lucha Underground (El Rey, 8 p.m.): Nothing’s more fun than guys in masks drop-kicking each other. See? The Last Alaskans (Animal Planet, 9 p.m.): Or, The Lastaskans. You can have that one for free, Animal Planet. Bullseye (Fox, 9 p.m.): Comedian Godfrey and the fourth or fifth favorite dude from the Twilight movies host this “extreme” game show where people get strapped into things and flung around the joint. This week, we are promised bumper cars. I Still Didn’t Know I Was Pregnant—This Can’t Be Happening Again! (TLC, 9 p.m.): In its quest to grant airtime to only the least self-aware people in America, this special hands over the reins to two separate women who have each given birth—twice—without knowing they were pregnant. The Game (BET, 10 p.m.): After nine seasons, the wives and girlfriends of players for the fictional San Diego Sabers continue to learn that relationships and professional football are a tough mix. Tonight, Blue, Keira and Malik face fallout from an elevator brawl—something all pro footballers are undoubtedly briefed on at this point. Celebrity Wife Swap (ABC, 10 p.m.): ABC, it’s names like Tami Roman and Kerri Walsh-Jennings that cause a lot of those “I thought it was called Celebrity Wife Swap?” jokes. Ripper Street (BBC America, 10 p.m.): In the squalid alleys of post-Jack the Ripper London, only the roughest cops can keep the peace. This week, they’re faced with murders associated with an underground abortion ring.